I needed a quick bite to eat so my Italian friend and my Filipino friend went to check out Sabra on Oak Street. I thought I must have had toilet paper dragging from my shoe because all the Jewish people outside and inside were just staring at me. Like an evil cold grill that made me feel like I was in the wrong hood. It was kinda like when the cops in Police Academy walked into the Blue Oyster. It was uneasy. 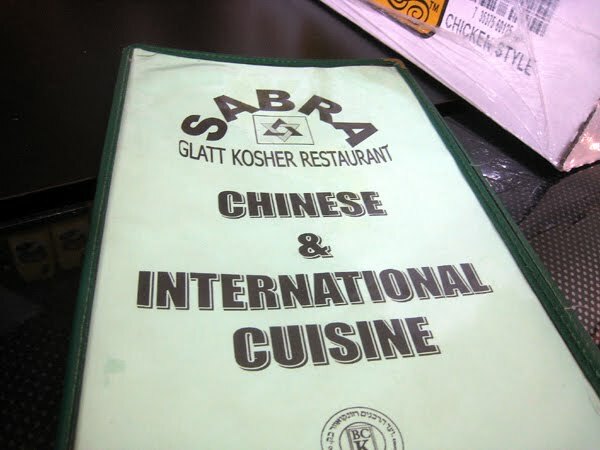 The weird thing is when I walked into this Jewish Restaurant and grabbed a menu it said "SABRA - Glatt Kosher Restaurant - Chinese and International Cuisine". After reading that, I was pretty much WTF, these Jewish people can't cold stare at me walking into a Chinese restaurant. This is partially my hood. We all ordered falafels while the patrons of the restaurant continued to stare at us, in the end it was too much and I had to walk to the other side of the street to eat my falafel on the sidewalk. 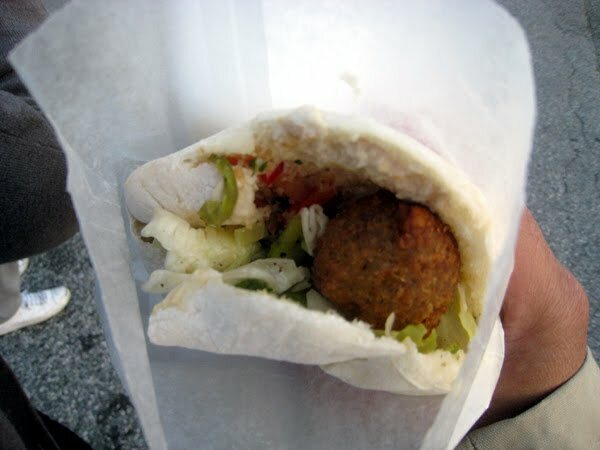 The falafel was pretty good but not amazing, I crown the Nuba falafel as the best in the city. Racist Jewish people?...Really? Have we learned nothing from Hitler?! "Interesting" experience....I guess no more visits for you! By the way what was the Chinese portion of the menu? The funny thing was the staff were Chinese. I might go back with a crew of asians and just eat Chinese food to see what kind of reaction I get from the patrons. I dont remember what was on the Chinese portion of the menu. I think chow mein and fried rice. It was all in your head. The same way when a white guy walks into a chinese restaraunt or store where white people normally don't go, it is curiousity and a desire to talk. Geez, get over it, BTW how did you know they were all jewish? Chinese kosher food is the norm. 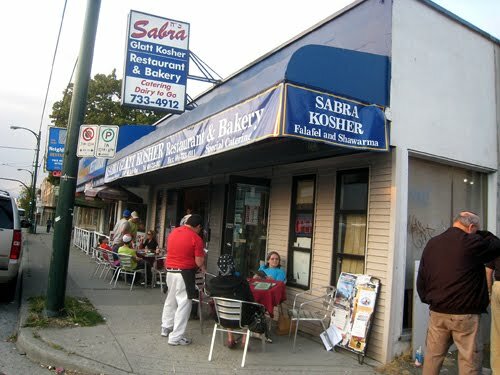 Jews like to eat chinese food, observant jews cannot eat food with pork, so Sabra makes some chinese dishes that are kosher ( usually the mixture is bad, except in NYC where I haven't eaten great kosher chinese food). A traditional jewish meal on a sunday night is chinese food. I live in this area and often the place is a ghost "restaurant"....it is frequented by the community regulars....probably not too many drop ins.Too bad the food wasn't that great. There was a piece not long ago in the NYorker about how China actually exports alot of kosher food. Not pork ribs, or any seafood, and it is not so simple but yes almost anything can be made kosher fot a price. I could tell most of them were Jewish because they were wearing yarmulkes. It may have been in my head but these guys were staring hard. No big deal, just really funny and kinda uneasy. Thanks for the heads-up. I live in the neighbourhood, and I was thinking about popping in for a felafel at the end of a bicycle ride someday. Sounds like a creepy place, so I'll give it a miss and get my felafel at the place on Oak and 16th. P.S. 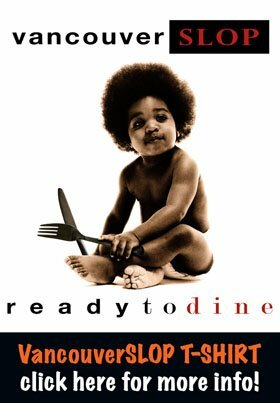 I second what the people have said about Chinese food being a cuisine that Jewish people like. My ex-wife was Jewish, from Miami, Fla. and it was a standing joke with her family that a typical Saturday nigh meal was Chinese takeaway. Nothing racist about it -- it's just a cultural habit with Jewish people because it's an ethnic cuisine that many of them like.